It has been a busy few weeks since the training event with the BBC, but we managed to meet up again last week to practice our rolling in a double kayak. Mark and I have done this before in the race skills test for Patagonia, and it means that you don’t have to swim, so its worth being able to do it well. We met up in Chiswick to get the boat, and then took it to the swimming pool in Ealing where Nicks club practice. As we walked in Nick remarked at how busy it was, last time he’d been there were only 5 other people there! So we squeezed our 6m long kayak into the already busy water, and began practicing. I will be paddling with Fi in Patagonia, so we had a go first. Fi has only just learnt to roll, and on the opposite side to me, so that was a slight issue. We had a few goes, and were getting there. Mid way through however Fi managed to clunk me on the head with her paddle, giving me a nice cut above my right eye! We finally managed to roll the boat, but then my brain got fried, it usually happens, you start over thinking the whole thing, and then can’t do it. So Nick and Mark had a go, and they have got it sorted, so should be fine, fingers crossed it goes OK out at the race. After a fun weekend working at the Trail Plus event near Pirbright, I was back to the Lake District to get some more things for Patagonia, and to do some training with Ant Emmet in preparation for my next huge challenge, The Epic Tri. 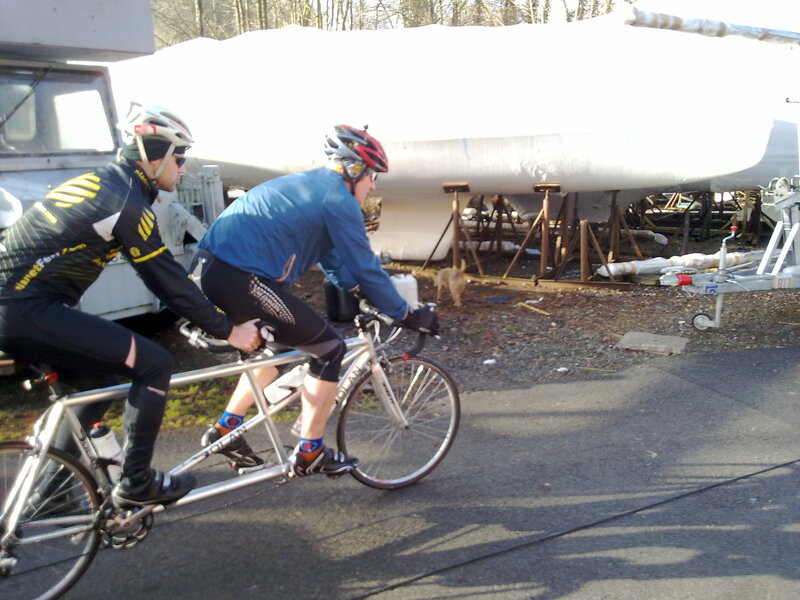 This involved getting out on the tandem for the first time, and also testing our new K2 Kayak. Ant and myself jumped on the tandem for a 2 hour ride, taking it from the house to Stavely and back via Underbarrow and over the Kendal Scar. This was perfect for us to test out the riding on the bike, through towns, steep ups and downs, tight and open corners and with busy cars coming past. It was a bit hairy to start with, but we soon got the rhythm going ok, it needs some tweaks and we need lots more practice, but we got going really well in the end. I was on the front of the bike this time, but the other one is set up so that Ant is on the front and I can take a break at the back. It is very odd on the back Ant tells me, you can’t make any movements at all as you will end up steering the bike, its a case of look forward and don’t move anything other than your legs! Last night I went to pick up the kayak from Phil at Fyne Boat Kits, and we took it out for its inaugural paddle this morning on the Canal. There are no fixed seats in the boat at the moment, as we wanted to see what position worked for us, and to get everything set before Phil fixes things in place, so it was a little uncomfortable on the foam seats, and we quickly realised that they were at the wrong angle. The kayak however is gorgeous, it paddles really well, and already slices through the water, so it should fly along once Phil has finished it up, with lovely varnish and wax on the hull. Phil took some video and pictures which we will have on our The Epic Tri page as soon as possible. Lots more work needs to be done by Ant and myself. Ant has the bit between his teeth though, training very hard at the moment coming back from his knee injury, I will be racing in Patagonia for the next 2 weeks, but will have to be back on it pretty soon after I return. Please follow how we are going, and tell as many folk as you can to spread the word about our challenge, so we can raise as much money as possible.